Thinking about making a new or used Toyota RAV4 your next vehicle? You’re in the right place! 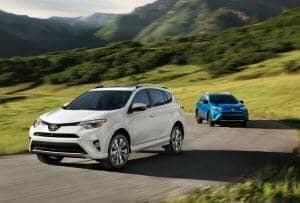 We at Andy Mohr Toyota have a wide variety of RAV4s to choose from, but that’s not all we have to offer. 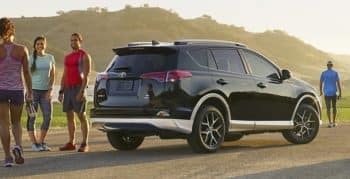 Below, you’ll find more information on the many features that make the RAV4 such a great vehicle, our Toyota RAV4 inventory, and our money-saving lease deals. Read ahead to learn more! As the capital of Indiana and the most populous city in the state, Indianapolis has a lot going on. While this city is currently home to nearly one-million people, its history of inhabitation spans all the way back to around 2,000 B.C. As the home of the world-famous Indianapolis 500, this city is a magnet for those interested in auto racing. As you can see, no matter which one of the Toyota RAV4 trim levels you choose, you’ll be taking home one incredible vehicle. View New Inventory With 10 incredible trim levels and even more customization options to take advantage of, it’s important to shop for your next RAV4 at a dealership with a wide selection. Luckily, when you shop with us, that’s exactly what you’ll get. Our inventory is packed with a wide variety of Toyota RAV4 vehicles in all shapes, sizes, colors, and trim levels. Even if you’re considering making your next vehicle a pre-owned one, our used Toyota RAV4 inventory has you covered. Once you have your Toyota RAV4 picked out, it’s time to think about payment plans. One of your options is leasing, and there’s no better place to lease than with us. Our dealership proudly offers lease deals catered specifically to those looking at the RAV4, making it accessible to budgets of all kinds. When you meet with our finance team, they’ll go over all the details and set you up with the best deal possible. After working with this team of experts, you’ll drive off the lot in your new RAV4 feeling confident about your payment plan. Now that you know a bit more about the Toyota RAV4 vehicles we have for sale as well as the many other helpful services we offer, we hope you’re ready to get the ball rolling. Get the car-buying process started with us at Andy Mohr Toyota today by giving us a call to schedule a test drive!